Newly released documents reveal that nearly a year ago, attorneys representing the family of LaQuan McDonald accused the city directly of intimidating witnesses in an effort to get them to change their stories. The lawyers alleged in two separate letters last March, that at least three witnesses to the teenager’s shooting were questioned for hours at a Chicago police station, threatened and ordered to change their accounts to match the versions being told by police. The attorneys, Jeffrey Neslund and Michael Robbins, made the same allegations in interviews with NBC 5 Investigates’ Carol Marin last May. But the newly released documents show that the lawyers directly confronted the city with the charges, even as a very different version of events was being maintained by Chicago Police. That official version is bolstered by detective reports obtained by NBC5 Investigates, which show that three different witnesses were taken to Area Central police headquarters to give official statements. One said she was in the parking lot of a nearby Burger King and heard shots but did not see who fired them; another indicated that he was in the restaurant’s drive-thru, and saw McDonald shot after he “ran toward the police vehicle”; and the third stated that he was sitting in a truck at the Burger King, saw McDonald and heard the shots, but did not see the shooter. 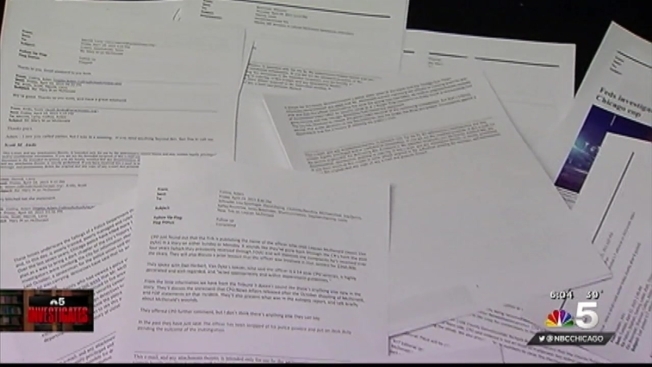 The letters were included in some 3,000 pages of documents, released to NBC5 Investigates in response to a Freedom of Information request. During their interview with NBC5 in May, the lawyers repeated the allegation that the witnesses were encouraged to change their stories. Asked for comment Friday, Chicago Police took note of charges filed against Van Dyke by the Cook County State’s Attorney, a probe by the Independent Police Review Authority, and an ongoing Justice Department investigation.